Rembrandt is a Legacy Library. Legacy libraries are the personal libraries of famous readers, entered by LibraryThing members from the Legacy Libraries group. 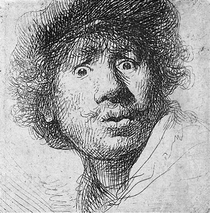 » Rembrandt Harmensz van Rijn's catalog. » Rembrandt Harmensz van Rijn's legacy profile. Rembrandt is also an author. » See Rembrandt's author page. I was born in Leiden (Holland), as son of a reasonably well to do miller, and shortly went to university there. However, I went on to become a painter and printmaker of considerable renown. After my apprenticeships I established my own studio in 1624 or 1625. In 1631 I moved to Amsterdam and there I married Saskia van Uylenburg in 1634. She was quite a catch, being the daughter of a wealthy lawyer and burgomaster of Leeuwarden. We lived happily until 1642, when Saskia died shortly after the birth of our son Titus. In 1639 we had even moved to a fashionable house I had built for us (now the Rembrandt House Museum). After Saskia's death I ran into increasing financial problems, partly because of the high mortgage on that house - but, frankly, also because of my somewhat exorbitant collecting habits. This ultimately resulted in my bankruptcy in 1656. On this occasion my possessions - amongst them my books - were listed for auction. This list has survived in the Amsterdam city archives, and has also been published - for example in translation in Rembrandt and the Italian Renaissance by Kenneth Clark. This Legacy Library is based on the list provided there, though it will ultimately also be checked against the original documents. My last years were far more difficult. I worked as an employee for a company owned by my son and my second (common law) wife Hendrickje Stoffels. I outlived my son, and died in Amsterdam in 1669. Though I didn't write any books myself, I do have an author page here on LibraryThing. About my libraryI mostly collected other things than books, and most of the books I did have were in fact portfolios of works by other artists I admired. The collections "Kunst Caemer (Gallery)" and "Ante-chamber" refer to the rooms in the house (now Rembrandt House Museum) where the books were found and listed. Apparently no books were present in the rest of the house. - "Portfolio" is used for anything from real portfolios to sketchbooks and bundles of prints or drawings. The 1656 list doesn't often distinguish between them very well. "Own work" is everything that contained work by Rembrandt. "That's my boy" refers to work by Titus. "Illustrated by Rembrandt" refers to the one known book Rembrandt actively contributed to. - All works on art have been attributed to national schools as far as possible. In case they contain work by more than one artist they may have more than one such tag. In case there is debate over which school an artist belonged to (notably Savery), the work is tagged both ways. - As far as possible all works have been tagged according to subject matter as well, leading to tags like "Animals", "Calligraphy", etc. The numbers in comments are the lot numbers from the 1656 bankruptcy document. They also contain bibliographical and biographical information where possible.